Last year, terrorists attacked Qadiani Ahmadiyya places of worship in Lahore just as they have attacked other shrines and places of worship in the last few years in Pakistan. This pattern is part of the general destabilisation that is a natural consequence of the so-called War on Terror being waged on the Western front of the country. These terrorist acts are against all norms of humanity and the perpetrators should be given the strongest possible punishment. Days after the sad event, the Qadiani Centre ordered its country organisations to get the most political mileage out of the attack, especially in Western countries. The actual words in the instructions were “after Lahore attack, everything is changed“. In Canada, the Qadiani community helped the government to set up an Office for Religious Freedom. In the United States, Naseem Mahdi, in his own style, set about to ascribe to the Qadiani Ahmadiyya all the “good Muslim” attributes outlined in Cheryl Benard’s paper [PDF] (wife of Zalmay Khalilzad), with little success. In Britain, Rafiq Hayat, with strategic political help from the recently-minted Lord Tariq, set about in his usual business-like way to attack British Muslims. The strategists used their advertising-industry skills to build on the existing concerns that the British government harbours about home-grown radicalisation. Here was how the British project playout out: A dossier was sent to UK media and government organisations trying to link events in Pakistan to British Muslim organisations. Their main target was the Khatm-e-Nubuwwat Academy, which was accused of distributing leaflets calling for the murder of Qadianis. In addition, several complaints were lodged with the Metropolitan Police in the boroughs of South London. When no prosecution was forthcoming, proxy spokespeople for this duo railed against the law, vowed to ask for a judicial review and convinced Lord Avebury to rail against the law itself. Despite a lot of media ruckus, nothing happened except that Muslim organisations became more vigilant. ‘Whoever has done this has done an injustice to the Majlis and it is a conspiracy against us. We are people who engage Qadianism on an intellectual level, staying within the constitution and the law. Taking the law into our own hands like this, or breaching the peace, or militancy is not part of our programme.’ – Maulana Allah Wasaya (audio above). In the ad, the name* ‘Shifaat Muhammadi’* has been appended to the legal name of the ‘Aalmi Majlis’, which can be presumed to be an attempt to avoid legal liability. The phone number in the ad is that of a poor chap named Munir who has been fielding calls from the BBC and other media. Now, what kind of murderers field calls from the media and keep explaining patiently that this is either a prank or a forgery? The Urdu in the ad is also feeble, and some sentences in it do not make much sense. 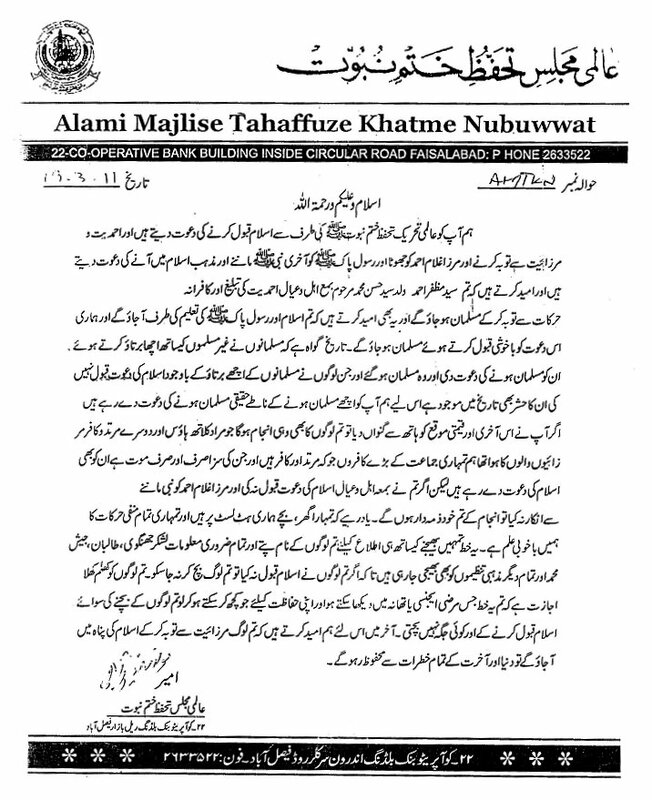 The letter is absolutely fake and presents such a ghoulish image of Islamic teaching which no bona-fide religious organisation can put on paper under its letterhead. It threatens to turn over lists of targets to terrorist organisations that have been banned in Pakistan such as Lashkar Jhangvi, Taliban and Jaish-e-Muhammad — again, all organisations familiar to Western media. This is not meant to sound funny, but talk about out-sourcing murder! Any person that knows the basics of the law in Pakistan or the political climate over there will never mention the names of these organisations without saying ‘kal-adam’ (former). Moving on, we see that the letterhead is in English and mis-spells ‘Aalmi’ as ‘Alami’ and puts the hyphen in the wrong place. Check out the official site of the Aalmi Majlis. The reference on top of the letter is in English but Pakistani clerks usually use Urdu correspondence references, especially in religious organisations, as it matches their filing system. Lastly, let us ask our common sense: why would murderers wait for one year and then learn elaborate office procedures in order to threaten other members of the same family whose member they had killed earlier?. As of this writing, we have also not seen a police complaint (FIR) from the people whose names were allegedly on the leaflet. One reason may be that the documents being leaked from the Ahmadiyya are so devastating that they want to divert attention and came up with yet another murder leaflet story this year. Another reason may be that they have become so used to the 10-20% compulsory membership contributions in dollars and pounds to the extent that this has become the central purpose of the existence of the Qadiani Jamaat, more than any other religious or literary purpose, and supporting the ‘persecution’ narrative consumes all their energies and resources. The third and most likely reason is that some more families need to be extracted from Faisalabad, and to our knowledge, Rafiq Hayat, Dr. Munawwar and Abdul Sami Khan are the architects of the asylum-seeking plans that are then passed on to the ‘General Affairs’ cell in Pakistan for execution. These plans either result in negative media coverage of Pakistan or emigration of specific people. for asylum. Now, we can wait and see which peope in Faisalabad were so eager to leave for the West that this whole story came about. We do not resent their migration to the West, but we request that they not trample Pakistan and Islamic teachings on the way there. Or maybe, this fake pamphlet story was just a heavy-handed and misguided competition with the US Qadiani team that has just secured the migration of 94 refugee claimants from Thailand who were imprisoned as criminals in Thailand. As we mentioned at the beginning of this story, the American Qadianis have their own style and the British leadership has a style that is unique to them, and this story appears to have the British team’s fingerprints all over it — another set of fake leaflets in the media.